This class is used for SNMPv3 targets. Definition at line 459 of file target.h. Assumes the following defaults: security_name: initial, version: SNMPv3, security_model: v3MP. Destructor, that has nothing to do. Definition at line 508 of file target.h. Clone operation for creating a new UTarget from an existing UTarget. Definition at line 521 of file target.h. A const reference to the enigne id of this target. Definition at line 591 of file target.h. Definition at line 598 of file target.h. An integer representing the security_model of this target. Definition at line 606 of file target.h. A const reference to the security name. Definition at line 538 of file target.h. oct - OctetStr that will be filled with the security name. Definition at line 545 of file target.h. Two UTarget objects are considered equal, if all member variables (beside the engine id) and the base classes are equal. Get all values of a UTarget object. 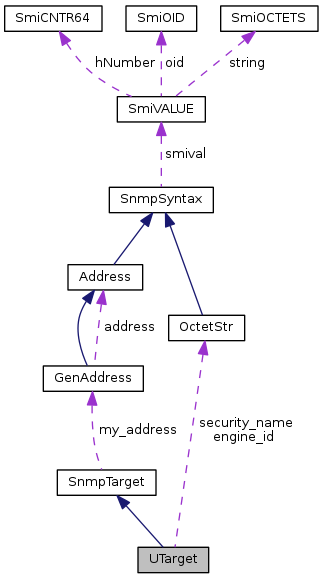 This method is the same as in SnmpTarget, but it deletes engine_id. In most cases it is not necessary for the user to set the engine id as snmp++ performs engine id discovery. If the engine id is set by the user, no engine_id discovery is made, even if the engine id set by the user is wrong. Definition at line 572 of file target.h. Definition at line 584 of file target.h. sec_model - The security model to use. Definition at line 613 of file target.h. Definition at line 552 of file target.h. Definition at line 559 of file target.h. Definition at line 658 of file target.h. Definition at line 656 of file target.h. Definition at line 655 of file target.h.